Much of the recent media, think tank and parliamentary debate surrounding the controversial rollout of Universal Credit (UC) has focused on the harmful six week wait for UC claimants to receive support. One core feature of UC that has been largely overlooked in this discussion, however, is the disciplinary role of sanctions and the various adverse impacts that they have on individuals. This short piece provides some context to the current UC sanctions regime by focusing on sanctioning policy for Jobseeker’s Allowance (JSA) claimants – one of the six existing means-tested benefits that UC replaces – under the previous Coalition Government (2010-2015). There are well known issues with how the DWP records and reports sanctions-related statistics. Perhaps the most reliable figure comes from a report on benefit sanctions by the National Audit Office (NAO), which found that nearly a quarter (24%) of JSA claimants between 2010 and 2015 received at least one sanction. Of this group, nearly three-fifths (58%) received one sanction, a fifth (20%) received two sanctions and just over a fifth (22%) received three or more sanctions. Figure 1 charts the monthly rate of JSA sanctions as a proportion of JSA claimants between 2010 and 2015. As Figure 1 makes clear, there was an immediate and marked rise in the sanctioning rate following the onset of the Coalition Government in 2010. In April 2011, the system of targets through internal benchmarks for sanctions referrals was removed, which may partly explain the observed fall in the sanctions rate from April to December of that year. June 2011 marked the onset of the Work Programme, which the NAO report identifies as a key driver behind the increase in sanctions from the beginning of 2012 to its peak in October 2013. At that point, the monthly sanctions rate was about 7.5% – over twice the rate of 3.1% in May 2010. Since October 2013, the sanctions rate has gradually returned to its pre-Coalition level, partly explained by falling numbers of people on the Work Programme. Whilst the fall in the sanctions rate from its height is to be welcomed, it is important to consider this change within the wider context of an increasingly harsh and punitive sanctioning policy. First, it took two years from its peak for the sanctions rate to fall back to its pre-Coalition level, meaning that the entire Coalition period is characterised by an abnormally high imposition of benefit sanctions. 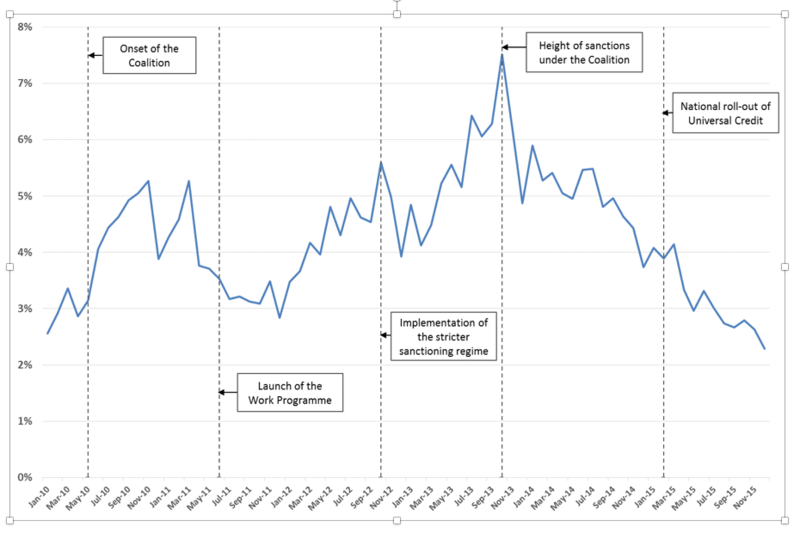 Second, the upheld rate – the proportion of referrals that result in sanctions – increased for the three main reasons for JSA sanction referrals throughout the period (not actively seeking work; missing an appointment; and not participating in the Work Programme) and has not since declined. Third, the JSA sanctions rate displayed in Figure 1 does not include sanctions associated with unemployed claimants of Universal Credit (UC). UC began with a pathfinder phase from April 2013 followed by a national rollout from February 2015. This means that the sanctions rate in Figure 1 underestimates the true level of sanctions from April 2013; currently available statistics show that the UC sanctions rate is very high. Importantly, furthermore, the Coalition massively increased the severity of sanctions through the Welfare Reform Act 2012. Since October 2012, JSA claimants can be sanctioned their full benefit income for a minimum of four weeks up to 156 weeks (three years), depending on the type and number of so-called ‘transgressions’ incurred. Whatever the overall rate of sanctions, therefore, the individual experience of a sanction was made significantly worse by the Coalition’s welfare ‘reforms’. In terms of JSA withdrawal alone, a four week sanction amounts to the loss of over £230 for somebody aged 18-24 and over £290 for somebody aged 25 and over. The increased frequency and length of sanctions under the Coalition amounts to what has been described as a “secret penal system”; in 2013, there were more sanctions imposed – with a higher penalty scale – than court fines. 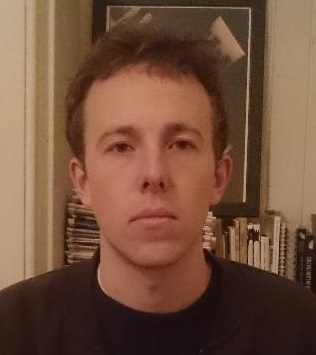 One important legacy of this period is that the system of escalating sanctions is a core part of UC, whilst several design features – relating, for example, to changes to hardship payments – mean that the UC sanctions regime is in fact much harsher than the already punitive JSA system that it replaces. An increasing body of evidence links sanctioning policy to a range of adverse impacts, including: serious financial hardship; homelessness; and negative physical and mental health effects. It is now beyond high time for a major re-assessment of sanctioning policy and the way that the social security system treats those it purports to support. The DWP does not publish statistics on the numbers of benefit sanctions referrals – see Dr David Webster’s quarterly briefings for estimates. Figure 1 uses the monthly adverse sanctions rate: decisions to apply a sanction for each month after reviews, reconsiderations and appeals.